This morning, my first in San Francisco since moving back here after a two year hiatus in Denver, I ran to the top of Mount Davidson. I had never been to Mount Davidson before, much less run up it. In fact, the tree-covered Mount had barely registered with me during my first 13-year tour of duty in this city, I’m ashamed to say, because the views from the top are spectacular. The climb up there is intense. But I guess the time I spent in and around the Mile High City has increased my lung capacity and I more or less sprang up that vertiginous hill. It would have been so easy to run all my favorite old San Francisco runs this morning: to Ocean Beach through Golden Gate Park, for example, or along the Marina to Chrissy Fields and back. But the desire to find something new in a city that’s very familiar to me sent me up Mount Davidson this morning. And at the top, I saw San Francisco in a fresh way. I bring up my morning run not to brag about my physical prowess, but rather to stress the importance of doing something new with the old. 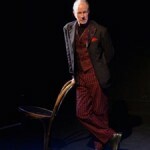 In “Lear’s Shadow,” which runs at The Marsh in San Francisco through Mary 30, Hoyle explores Shakespeare’s tragedy from the perspective of The Fool. “Lear” is obviously well, well, well-worn turf. And Fool-centric adaptations of the play are also not uncommon; the Phoenix Theatre in New York, for instance, created a show called “The Fool’s Lear” last year. So the question is: In the face of such familiarity, what fresh perspective does Hoyle’s Fool bring to the party? Clearly, Hoyle was made to embody The Fool, with his long background of playing clowns. He trained with the great mime artist Etienne Decroux in Paris and originally made his name in the Bay Area as the clown Mr. Sniff in The Pickle Family Circus. It could also be said that at this point, the veteran actor has reached a stage in his career where visiting “King Lear,” a drama of aging, makes sense. Plus, Hoyle has always been something of an actor-philosopher, a thinking man’s comic. 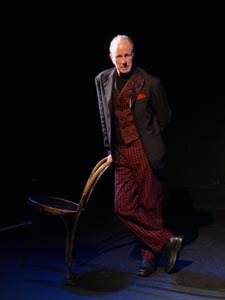 So his decision to take on one of Shakespeare’s wisest clowns, Lear’s Fool, and include occasional quotes from other Shakespeare plays that involve similarly dark funny men (the roles originally played by Shakespeare’s colleague Robert Armin — “As You Like It”‘s Touchstone” and Feste in “Twelfth Night”) adds to the particularity of the performer’s vision. Over the course of 90 minutes, the performer retells the story of Shakespeare’s drama by taking on not just the role of The Fool, but also that character’s mimicry of Goneril, Regan, Cordelia and the King. The characterizations are clearly-drawn, if a bit forced. What’s interesting about Hoyle’s particular take, though, is his view of The Fool as a working man — and, even more piquantly, a working man who has suffered at the hands of commerce. Hoyle is an actor who has explored and criticized the forces of capitalism in his art in the past. And in “Lear’s Shadow,” The Fool is portrayed as an exploited worker. The show is fraught with jokes and commentary about being laid-off and about being subject to the forces of an inhospitable workplace. At one point, Hoyle even takes a swing, for the sake of contemporary resonance I guess, at the Google buses that have come to symbolize all that is evil about the Bay Area’s current economic landscape. In this way, Hoyle version of “Lear” feels like my run up Mount Davidson: We’ve been here many times before, but this is quite different.